We're lucky we live in a place that still has enough trees and watery surrounds to have birds living all around us. Mum wood duck was at the side of the pool - keeping an eye on this youngster! 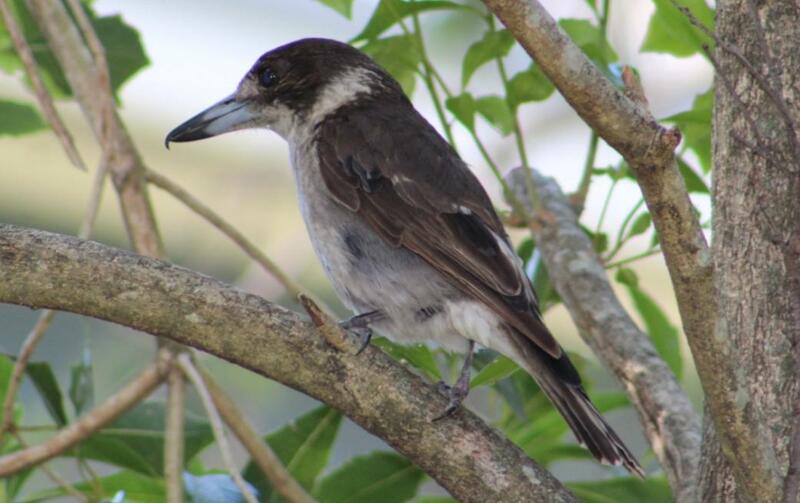 This Butcher Bird sang the song of 10 other birds outside the Pittwater Online window on December 2nd, 2016 - kookaburras, currawongs, lorikeets, cockatoos, bush turkeys, crows - it's watching a cockroach in this photo, which it then caught and ate. 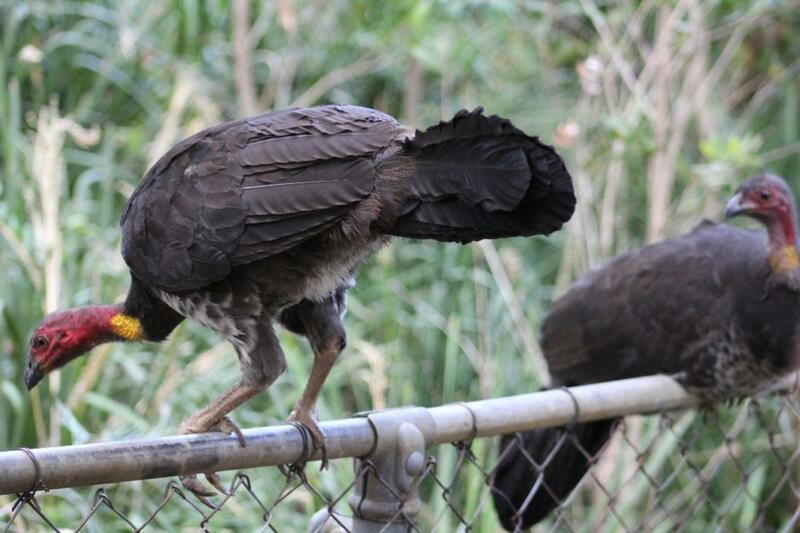 A family of bush turkeys has moved into our yard - a mum, a dad and these two now grown bigger youngsters. They sit on the fence like this, giving editorial advice in their chook-like turkey voices, or chase each other round and round the lawn. When it's starting to get light every morning they're underneath the window talking at us again and scratching through the leaves under the gum trees to find some breakfast - they seem to be greeting us each each and every day - all in turkey speak! 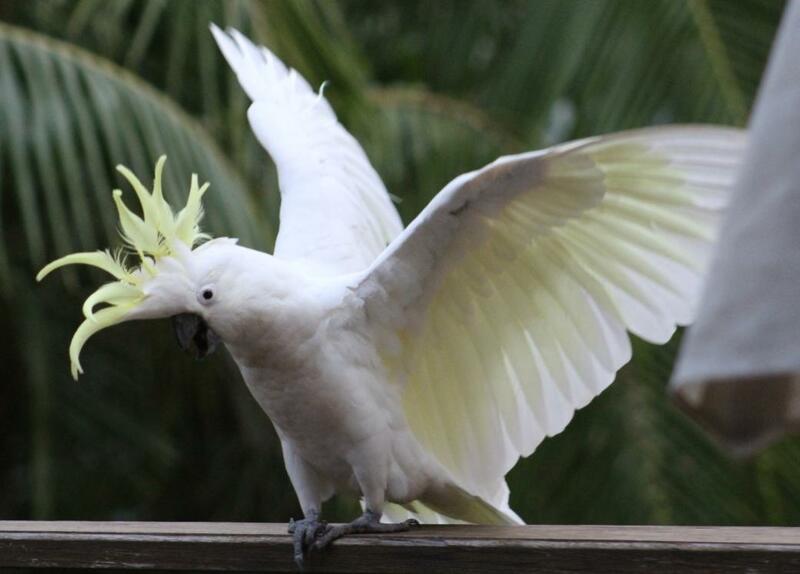 At dusk each day this young cockatoo stands on our deck railing and does this dancing and screeching call to all his friends in the spotted gum trees in our front yard - each time he does that call, which they call back, he throws his wings up like this. I wonder what they're calling to each other? Then they flap off across the valley to their roosting trees before the sun goes behind the hills. These birds aren't birds at all! They're called gyrocopters and we spotted them playing around over Warriewood Beach and Turimetta headland on Saturday morning - there were two of them - maybe they too are the kind of birds of a feather that flock together! They certainly have a very unbirdlike song ...or sound!